One thing we enjoy is a nice road trip but it is in the middle of the week and this is the closest we can get today, lol. VROOM, dreaming away! 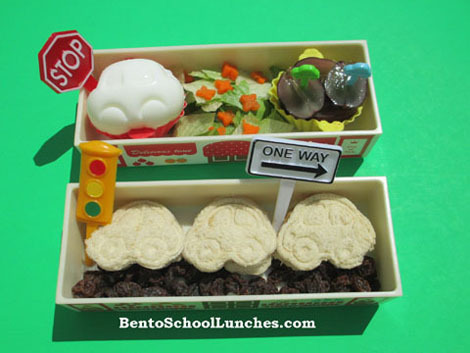 In this bento: Top tier contains car shaped egg, lettuce and carrots, seedless black grapes. Bottom tier contains SunButter car sandwiches on a road of raisins. Packed in double tier lunch box.